From destroyed rocky roads to muddy and wet ones, through ice-cold winds and heavy rain, I somehow found myself nearing a place that only few spoke of. 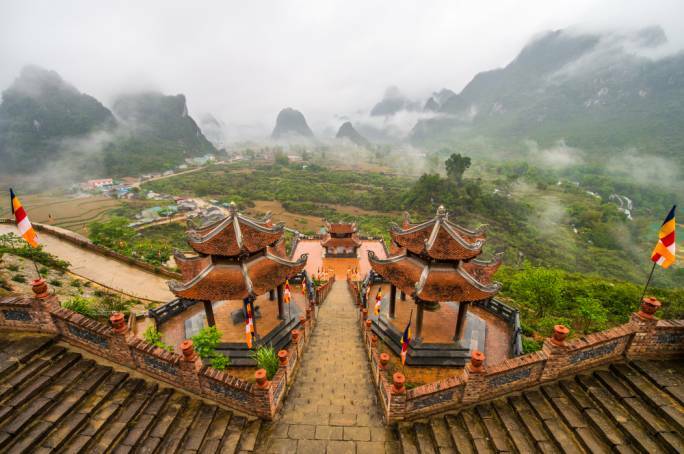 A place that has formed over thousands of years and has been the subject of myths and legends that have been shared within the local Vietnamese and Chinese settlements. 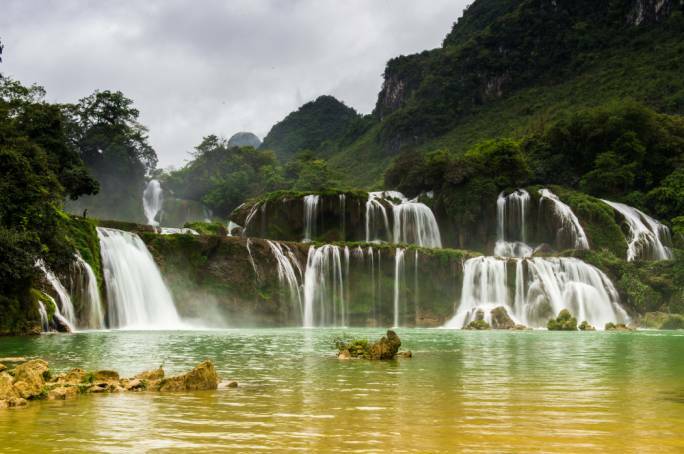 Almost 300km from Hanoi in Vietnam lie the waterfalls of Ban Gioc, which straddles the international borders between China and Vietnam, offering some of southeast Asia’s most scenic views. When travelling around the north of Vietnam, locals always recommend visiting Ban Gioc, but whenever I mention my interest in visiting the place they call me “dien”, which is Vietnamese for mad. Though these falls are the things that fairytales are made of, getting there is somewhat difficult and locals are always torn between recommending the falls and warning you away from them. 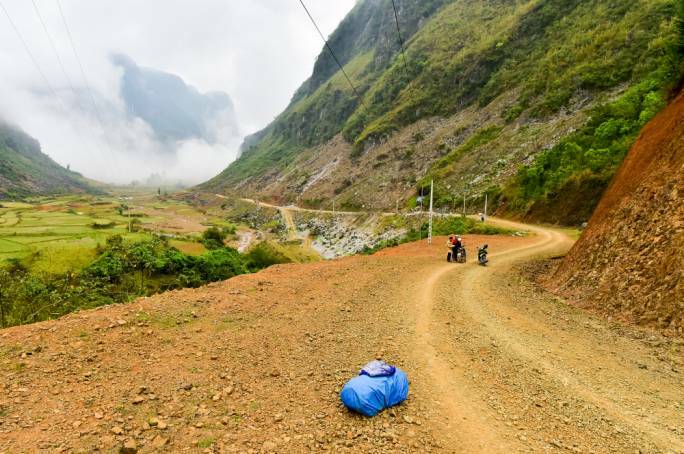 When my journey took me to an area called Cao Bang, that is where I decided to go forward with my plans to visit Ban Gioc. Before I set off I got stuck into the planning stages. This trip needs a little more planning as accommodation along the route is very limited. There is a Chinese resort near Thac Ban Gioc and a Vietnamese family offering rooms for rent in a small village close to the falls. It took me four hours to reach the small village, but I made it. Definitely one of the harder roads I’ve had to pass through and to add insult to injury it rained through half of the ride and many parts of the road were completely destroyed as they were building a new one. This made the track extremely muddy and on a 130cc 1970’s Honda WIN, with 40kg of backpacking equipment to the back end things get tricky very quickly. The countryside was absolutely stunning, and the people were all too curious and inviting. I loved it, my worries about the conditions of the road soon diminished and I relished passing every corner and the new friendly faces and even more stunning scenery that revealed itself. Once you start to ride you instantly become connected to the environment around you, be it a village amongst the rice paddies, a village set under the mountains or the mountains themselves. 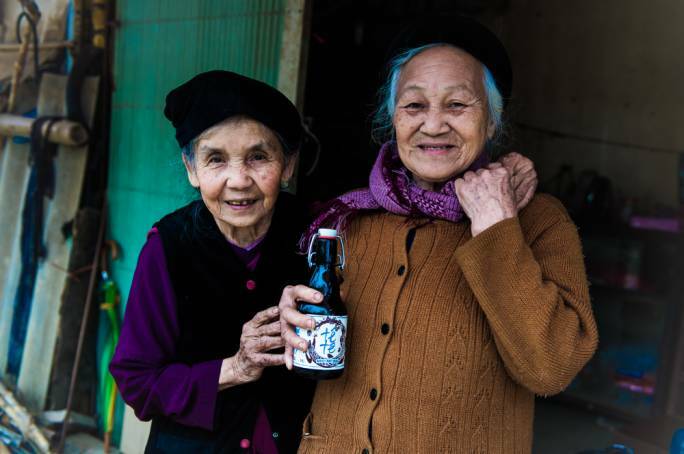 Somewhere about 30km from the small village where I was to make camp, I came across two tiny old ladies. They were both sitting and smiling, having a laugh together whilst watching over what looked like a shed with some goods inside. The younger of the two came up to me with a big grin and barely any teeth, whilst the other hung back in the wooden shed. Both were somewhat amused by this young foreigner, solo-travelling around Vietnam, all alone on an old motorcycle, without even a wife! Eventually we managed a little communication. The ladies were both over 90 years of age, the youngest spoke Russian and they were selling goods whilst their children worked the land. While we spoke, a small crowd of children and some locals gathered, intrigued to see what I was up to. It’s moments like these that I really appreciate travelling alone. When you travel in company, you miss out on some of these experiences with the locals that turn out to be some of the best of the entire trip. I bought some water and with the kids running in my trail I rode off for the last bit of the journey, looking forward to laying my head down, no matter how hard the mattress was. When I got to Cho Trung Khanh it was almost dark and after going around in circles a few times to find the place, I finally found this tiny two-storey building. It didn’t have any kind of signs advertising accommodation for rent, but that didn’t stop the friendly family of welcoming in. 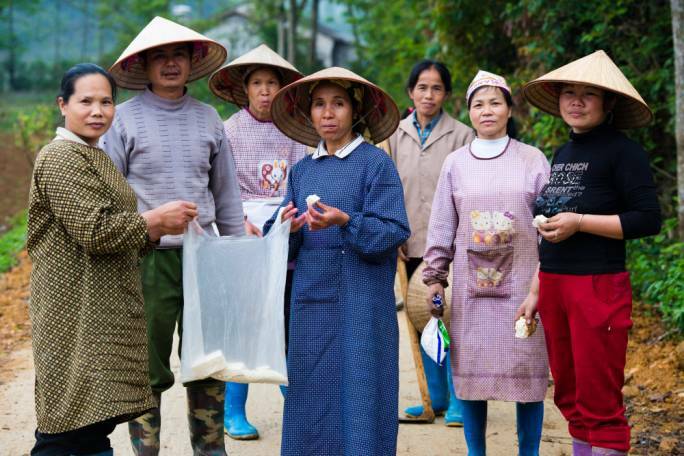 I drove up into the living room, as you do in most of rural Vietnam, and made acquaintances. This was indeed the accommodation I was looking for, just a simple family house that offered three rooms to travellers upstairs. The whole family occupied the two rooms downstairs; parents in one room and children with their grandparents in the other. Then next day I rode off to finally get a glimpse of the magnificent Ban Gioc waterfalls. I only had to cover another 20km and I planned to do this over a whole day. That way I could enjoy the ride there nice and easy, and take it all in. Then once I arrived I could set up all the time lapses I wanted whilst taking photos and exploring. And this is exactly what I did; I captured some amazing images on the way in with a couple of early morning time lapses. Then as I drew closer to the waterfalls I came upon this temple on the top of a mountain. My bike struggled but she made it. I was breathless, this felt like a monastery on top of the clouds. I set up two time lapses for an hour and a half, took a few photos and just spent half an hour doing my own sort of meditation. There was such a sense of pure peace in the monastery and only two monks wandering around doing their thing and the few times we made eye contact, we all just smiled. But before I left and made my way down again, I went to pay my respects and say thank you. From that we ended up playing a bit of takraw, which is a southeast Asian sport of footvolley. After riding 90km from Cao Bang and spending that night in the village, I was finally on the doorstep of what I consider to be a wonder of the world, Ban Gioc. The largest of the waterfalls is 60 metres in height and the views are spectacular. The karst topography is formed by the dissolution of the soft limestone and creates multi-level terraces of waterfalls and pools. Local fishermen cast off the treacherous edges of the pools to catch local trout, whilst few locals and foreigners wandered around in awe. The majority of visitors are made up of Chinese, whilst I and a handful of others made up the rest. I lingered there for hours, taking it all in and capturing what I could. I swam, spoke to a local old lady who sold local souvenirs and items such as fishing tackle and gems. There were a few small stalls of basic local nibbles which I filled myself with and I also had my photo taken with many local Vietnamese and Chinese people not used to seeing many foreigners around. It made me feel like a star for the afternoon. This was quite an action packed journey, one that I was very pleased to have taken. I am very thankful for all the people who mentioned this place to me. After a full day exploring, I made the most of the Chinese resort close by, got a full meal and coffee for just €10 and I said my final goodbyes to this heavenly place. Then I made my way back just before sunset to Cho Trung Khanh. I had to prepare for the next 22 days I had left on the road around Vietnam. 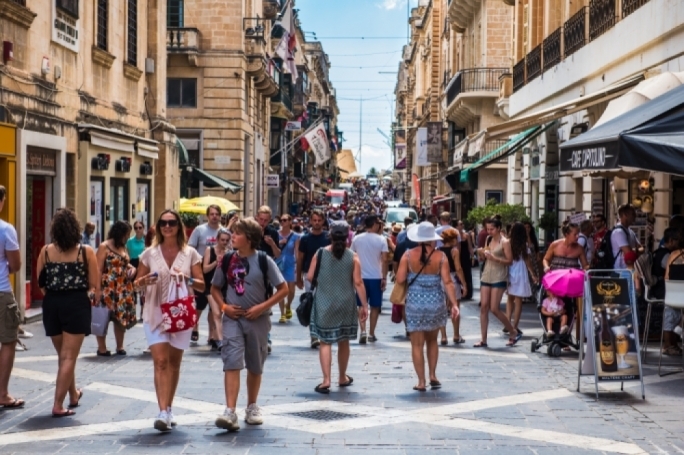 Emirates offers daily flights between Malta and Hanoi in Vietnam with a stop over in Dubai. 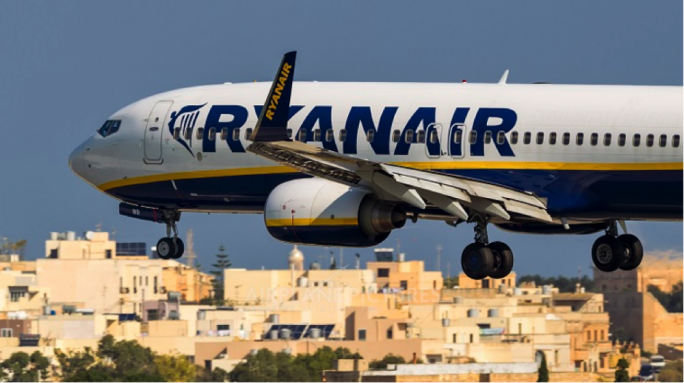 Flights departing from Malta on 12 October and returning on 26 October were priced at €837, including tax, at the time of going to print. From Hanoi you can take a public bus to Cao Khanh and then get a motorbike taxi to the falls. Alternatively, you can rent your own motorbike and take the whole trip by bike.